I need a square divided into 23rds. It's easy enough to make 24ths and cut off one unit, but how to get real 23rds? John Montroll in his book Origami Polyhedra Design gives some great methods for finding landmarks (i'd post the page but can't due to copyright). If you have the book, do take a look. This method is finding the highest power of 2 underneath the number of divisions you want, in this case 16 is the smallest under 23. Then take the number of divisions wanted, subtract the power of 2, and use that as a fraction with the power of 2. in this case, 23—16=7, so we put on the side 7/16. Then fold from the 7/16ths landmark to the opposite corner, and along the diagonal you'll have your landmark. 2. mark 1/4 of the edge and fold the corner. 3. fold the angle bisector (as indicated). 4. fold a crease from [the intersection of previous fold with diagonal] towards the edge of the paper. 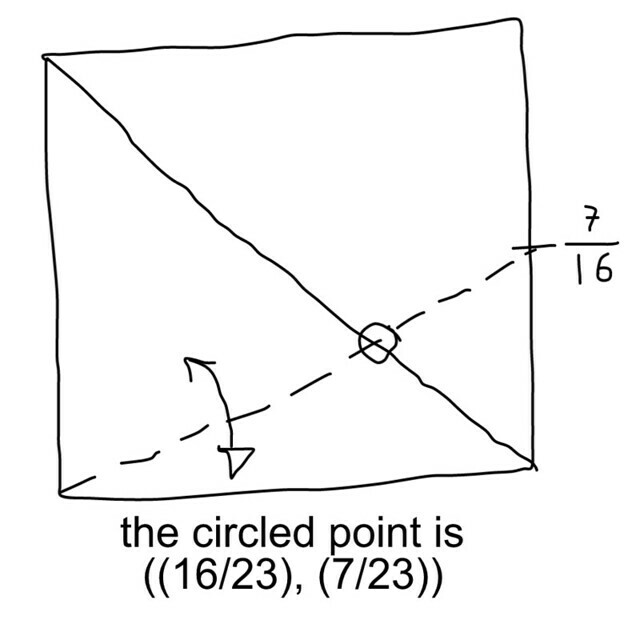 5. fold the line connecting the two circled points. 6. the intersection of the prev. crease with the diagonal is the reference point. So how do you work out ratios like that one, with √2 in it? Merlyngami wrote: So how do you work out ratios like that one, with √2 in it? The square root of 2 is the length of the diagonal of a 1×1 square. So the easiest way to get multiples of √2 is to take the diagonal of a proportionally larger square. Similarly, you can get other roots as diagonals of different rectangles, via the Pythagorean Theorem, e.g. √5 is the diagonal of 2×1 rectangle, etc. you basically need to divide the paper up into equal parts of either '1', '√2', or '1+√2'. Then be able to measure '1' and '√2' from those 'equal parts' on the opposite side. We basically make use of Similar Triangles. For all of the shapes in the pic above, we just need to make two triangles created by two straight lines such that the ratio of the two triangles' size is the ratio we're looking for. ____-> Then, I measured 1 'part' of 1 from the other side. I'm sorry if this was all confusing. (It means I'm bad at explaining ) But if you can understand my first picture (dividing into 5), you're on the right track. So... I had a try at getting the reference point for 4 : 5+2√2 (using the techniques shown in shuanidanaijesu's post), but I couldn't really find anything that was any nicer to fold than the referencefinder solution. Does anyone know if there is an elegant folding sequence for this ratio? (I don't know if this is 'elegant' but) One way to find "4:5+2√2" is to first find "4+2√2:5" then split apart the larger and find "4:2√2:5"
I decided to find "4+2√2:5" instead of "4:5+2√2" because of the numbers "4" and "2√2". The reason why these two numbers are important (and why I wanted to keep them together) is because 4:2√2 = √2:1 and √2:1 is a ratio that can be easily obtained by folding the angle bisector of 45degrees(which is step 1 and 4 above). Merlyngami wrote: [...] but I couldn't really find anything that was any nicer to fold than the referencefinder solution. For complex ratios, referencefinder's solution might give you a simpler folding sequence because RF doesn't necessarily look for 100% accurate results. And "the amount of accuracy you give up by using RF + shorter solution" might be more beneficial than "the amount of time it takes to find an accurate solution + longer solution". And nobody will be 100% accurate at folding paper so even my solution will get a tiny bit of error during the folding process. All I wanted to say is that the RF solution is usually as good as the 'accurate' solution, so (if you're not like me who likes math and likes to figure out these reference points,) using RF might be better/easier. Part of the reason I wanted to a folding sequence like that is that im thinking of drawing a cp for my velociraptor, but I want to have a way to find the reference that can be shown in one step, like how you drew it (referencefinder solutions wouldn't be understandable if you showed all the folds in one step). One thing I think I should bring up here is Robert Lang's Crossing Diagonals Theorem. He mentioned it in some detail in a paper (one I don't have the link to at the moment, unfortunately), but it helps a lot with finding those weird irrational proportions. I admit I don't fully understand the math behind it, but I understand enough that I've been able to find some pretty cool ratios for my designs. The proportion 1 : (1+sqrt2), as mentioned above, is found easily enough by the use of a simple bisector. This sets the side of the square at length (1 + sqrt2), and the bisector hits the opposite edge exactly 1 unit from the nearest corner. This means that the distance from that point to the farther corner is sqrt2 units, and that creates a sqrt2 : (1+ sqrt2) rectangle with the opposite edge of the square. Crease the diagonal of that rectangle, and any rectangle with that crease as the diagonal has those proportions sqrt2 : (1 + sqrt2). So there's the (1 + sqrt2) part of the proportion. As I mentioned, any rectangle with that diagonal has those proportions. So the next step is to compare sqrt2 and the other half of the proportion (namely 2sqrt2). You'll notice that they simplify to 1/2, which means we need a rectangle with proportions 1 : 2. It just so happens that 1 : 2 is extremely easy to find: It's the midpoint of the opposite side to the corner. All you have to do is crease the angle bisector of the top corner and connect the other end of the crease with the corresponding bottom corner. Then find the midpoint of that side and connect that to the opposite bottom corner. A perpendicular from the point of intersection divides the bottom edge into (1 + sqrt2) : (2sqrt2). It would be a lot easier to explain if I had a diagram, but hopefully I described it well enough. The same method (or an analogous one) can be used to find literally any set of proportions you need; the only catch is that there's no guarantee of a low number of steps. But I find it to be very useful for my own designs--and origami in general.